Nevärlläjf is a young Swedish quintet of synths, guitars, bass, and drums. By young, I mean that these guys were in high school in 2005. Yet their music belies their age with its sophistication, orchestrations, and sheer brilliance. 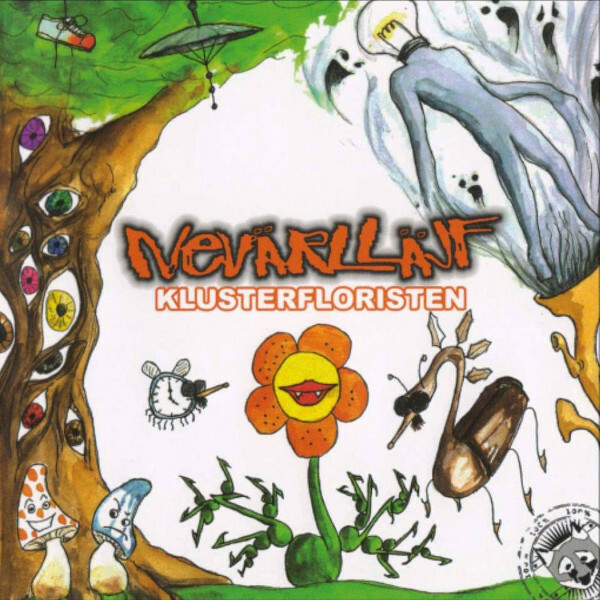 Nevärlläjf plays an instrumental amalgam of jazz, jazz-rock, progressive rock, and 70s Swedish rock. This is some ingenious stuff. I can detect influences from of course Robert Fripp and King Crimson, but there is also a Gentle Giant element, especially on “Flourtantskosmos,” that also includes some cabaret style snippets. Overall their music is lively, tasteful, sophisticated, but never in your face. And it is so full of changes and styles that it keeps you entertained throughout the disk. The band trades licks back and forth and you never know what you will hear next, be it a short John McLaughlin-esque guitar solo, bluesy drums, Hammond organ, crazed and demented voices, or “shave and a haircut, two bits.” The nine tracks flow seamlessly from one to the next, most are six minutes or less in duration, and it takes you by surprise by how fast you move from track to track! And to top it off there is the insane psychedelic album artwork complete with humanized mushrooms, eyeball clusters ala Thirteenth Floor Elevators, lethal flowers, and alien creatures. As this is their first release, Nevärlläjf is definitely a band on the rise and one to watch closely over the next few years.